I just wanted to share this video that was made by CNN and shown at the awards ceremony last week where Dhondup Wangchen was honoured by Committee to Protect Journalists with their 2012 International Press Freedom Award. A huge thank you goes to CPJ, not only for this award but for their support for Dhondup Wangchen and “Leaving Fear Behind” ever since 2008. 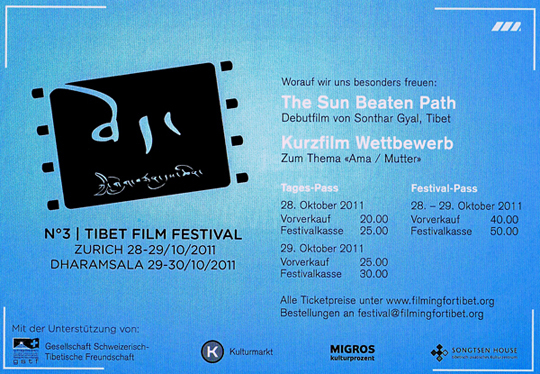 Timed to coincide with the Tibet Film Festival(s) taking place from today onwards in Zurich and Dharamsala, WITNESS has published an article that I originally wrote for the Festival’s programme on the rise of Tibetan video activism since 2008. Below is the talk I gave at the Geneva Summit earlier this week. I was speaking on the panel titled “After Liu Xiaobo’s Nobel Prize: the Situation of Human Rights in China” and there is a video of the session online on www.genevasummit.org I can’t work out how to embed that video into this post! I am adding links into the text for those who wish to find out more! My name is Dechen Pemba. I am a UK born Tibetan and I am the editor of High Peaks Pure Earth, a website that monitors Tibetan blogs and translates online writings by Tibetans in Tibet and the People’s Republic of China from Tibetan or Chinese into English. Most of my working life has been dedicated in some way to advancing the issue of Tibet. In 2002, I was a volunteer translator for two Tibetan nuns who were political prisoners in Tibet for a six month European and US tour organised by Amnesty International. I also worked for almost 4 years for the International Campaign for Tibet Germany as a full-time campaigner, working on many human rights issues such as highlighting the cases of Tibetan political prisoners, for example the Panchen Lama who has been missing along with his family since 1995, and Tenzin Delek Rinpoche, a high profile monk in eastern Tibet who was targeted, framed and sentenced to death by the Chinese government. Due to mass campaigning and lobbying, Tenzin Delek Rinpoche’s deathsentence was commuted to life imprisonment. Despite working full time on Tibetan issues, I felt that it was necessary to understand China in order to gain an insight into the situation on the ground in Tibet today. Therefore I decided to move to Beijing in 2006 to learn Chinese at the Central University for Nationalities. I lived in Beijing until 2008, during which time I was able to travel to Tibet several times. As everyone here will be aware of, Tibet erupted in widespread protests against Chinese rule just over 3 years ago, starting in Lhasa on March 10, 2008. For several months afterwards, the whole of Tibet was a media black hole, no foreign journalists or tourists were allowed to travel in and the whole area was under military lockdown. Despite promises of media freedom by the Chinese government in the lead up period to the Olympic Games in August 2008, these promises were not kept in Tibet’s case. “If someone has this [type of] song [on their mobile phone], they are detained, jailed from 10 to 15 days, heavily fined, and even brutally beaten”. Despite this fierce crackdown all over Tibet, protests have not stopped, Tibetans continued to protest to voice their grievances throughout 2009 and 2010 against specific issues, for example in May 2009 a peaceful protest by Tibetans in Kardze Prefecture of Sichuan province against the construction of a hydroelectric dam leading to displacement of tens of thousands of local Tibetans was forcibly broken up by police with six people injured. In August 2010, at least four Tibetans were killed and 30 injured when police officers opened fire on a crowd outside the Palyul county government offices in Kardze Prefecture. Local Tibetans were protesting the expansion of a gold mining operation damaging to the environment. Most recently in October 2010, thousands of students in Eastern Tibet took to the streets in support of Tibetan language and against a new policy that would increase Chinese-language medium teaching and undermine Tibetan language study. Since 2008, Tibetans have faced severe punishment for merely exercising their right to freedom of expression. According to the International Campaign for Tibet, more than 50 Tibetans, including 13 writers, involved in the arts and public sphere are either in prison, have been ‘disappeared’ or have faced torture or harassment for expressing their views. Under the circumstances, Tibetans today are finding new ways to assert their identity and resist passively, such as refusing to celebrate Losar, Tibetan New Year, in 2009, out of respect to all those who died in 2008. Tibetans are also engaged in strategic nonviolent resistance, a new movement called “Lhakar” is underway currently. Lhakar literally translates as “White Wednesday” and it is considered an auspicious day as it’s the soul day of His Holiness the Dalai Lama. A growing number of Tibetans are making a special effort to wear traditional clothes, speak Tibetan, eat in Tibetan restaurants and buy from Tibetan-owned businesses every Wednesday. My work today with High Peaks Pure Earth is dedicated to supporting Tibetan voices from inside Tibet and the PRC. Tibetans are fully capable of speaking for themselves and their voices are often eloquent and extremely courageous. It is important for these voices to be heard, amplified and represented. New media has afforded many new opportunities for communication and exchange between Tibetans and the outside world but not without risk. Blogs, social networking sites, SMS and microblogs are all being used by Tibetans as a forum for expression. The most well-known figure using these new technologies is Tibetan writer, poet and blogger Woeser. Woeser’s blog is regularly translated from Chinese into English by High Peaks Pure Earth and hers is a rare bold Tibetan voice coming directly out of the PRC today. Woeser is using her blog and social media such as Twitter to make the true feelings and situation of Tibetans in the PRC today known, fort his she has been placed under house arrest and harrassed by the police several times. Her blogs, Skype, email and Twitter have been hacked several times by Chinese nationalists. The Chinese government fear free exchange between their citizens, especially between Tibetans. It is no coincidence therefore that prior to March 10 last week, a prominent Tibetan social networking site MyBudala was inaccessible along with Tibetan language blog-hosting sites DobumNet and Sangdhor. These sites are still down today. Sentenced to 6 years in prison in December 2009 for making the documentary film “Leaving Fear Behind” that interviewed Tibetans about their feelings towards Tibet, China and the Olympic Games. 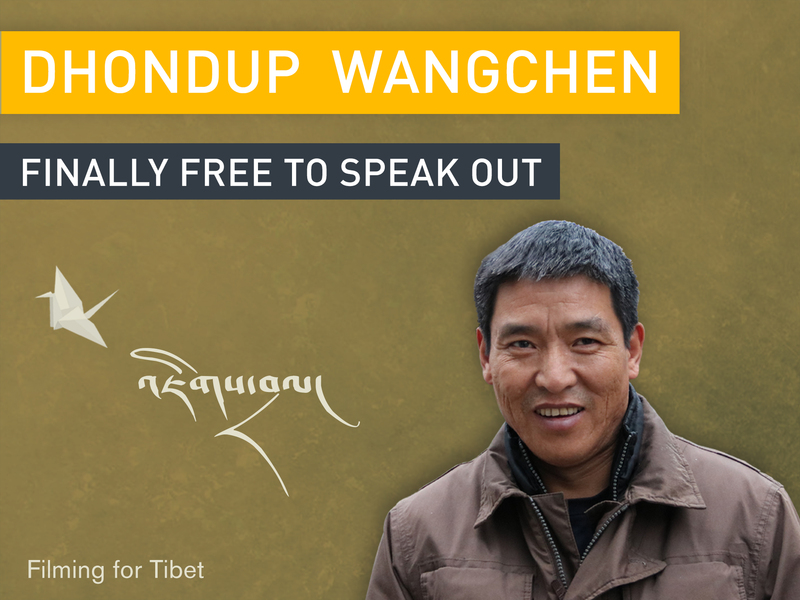 Dhondup Wangchen was detained and tried in secret, two sets of Chinese human rights lawyers were barred from representing him. He is currently in Xichuan Labour Camp in China’s Qinghai province. He has contracted Hepatitis B in prison and is receiving no medical treatment. Both NGO workers, Wangdu and Migmar Dhondup were accused in December 2008 of collecting “intelligence concerning the security and interestsof the state and provid[ing] it to the Dalai clique…prior to and following the ‘March 14’ incident”. Wangdu received a life sentence and Migmar Dhondup a sentence of 14 years. Female cadre and writer from Ngaba, eastern Tibet. The exact details of the charges against her are not known, but she was convicted and sentenced to 5 years in prison on November 3, 2008 for passing news through the phone and internet about the situation in Tibet to the outside world. (New York, August 3, 2009) – The Chinese government should ensure that that the trial of Dhondup Wangchen, a Tibetan filmmaker arrested in March 2008 on charges of “inciting separatism,” is open and fair, and that he is represented by the counsel of his choice, Human Rights Watch said today. In July 2009, the judicial authorities in Xining, Qinghai province, arbitrarily replaced the lawyer chosen by Wangchen, Li Dunyong, with a government-appointed lawyer. No justification for doing so was provided. Wangchen had only been allowed to meet with Li once, in July 2009. Li reported that his client had been tortured in order to extract a confession and that some of the injuries he sustained as a result were still painful a year later. During that discussion Wangchen stated that he intended to plead not guilty and had admitted no wrongdoing during his 16 months in detention. Dhondup Wangchen, 35, was arrested on March 26, 2008, in Tongde county, near Xining, the provincial capital of Qinghai province. Wangchen had conducted about a hundred interviews with ordinary Tibetans between October 2007 and March 2008 for a documentary film shot without official approval in Tibet. The documentary, “Leaving Fear Behind,” was later edited abroad and distributed to foreign journalists during the 2008 Beijing Olympic Games. Unauthorized documentaries in Tibet are rare because of the risks of arrest or retribution by the authorities against both the filmmakers and those they interview. Wangchen, who is also known by the Chinese names Dunzhu Wangqing [顿珠旺青] and Dangzhi Xiangqian [当知项欠], was initially detained at the Ershilibu detention center in Xining. In July 2008, he was then transferred to a government-run guesthouse in the vicinity, possibly for the purpose of interrogation, before being sent to the No. 1 Detention Center in Xining. Wangchen has been suffering from hepatitis B, for which he says he has been denied adequate medical treatment. Jigme Gyatso, a monk from Qinghai province who worked with Wangchen on the documentary, was arrested at the same time. He was released on bail seven months later, on October 15, 2008, and reported that he had been tortured in detention. Several other people involved with or appearing in the documentary have also been investigated by the authorities. In July 2009, the Xining judicial authorities instructed Wangchen’s lawyer, Li Dunyong, that he was not allowed to continue to represent him, and informed the family that the court would designate a government-appointed lawyer for the trial. This was in violation of China’s criminal procedure law and its obligations under international human rights law, which guarantee criminal defendants the right to choose their own defense counsel and to meet with their counsel while in detention. Particularly after a wave of protests across the Tibetan plateau in March 2008, trials of Tibetans have become politicized to such an extent that independent and impartial adjudications are extremely rare (http://www.hrw.org/en/news/2009/03/09/china-hundreds-tibetan-detainees-and-prisoners-unaccounted ). Human Rights Watch expressed grave concern about the charge of “inciting separatism.” The current definition of “inciting separatism” under article 103 of the criminal law is incompatible with international human rights standards, as it criminalizes protected speech and violates the right to freedom of expression by conflating criticism of the government and its policies with a state security threat. Sentences on separatism charges range from five years of imprisonment to the death penalty. Human Rights Watch called on the Chinese government to ensure that Dhondup Wangchen’s trial met international fair-trial standards, including the right against self-incrimination, the exclusion of evidence obtained under torture or other mistreatment, and the right to be represented by a counsel of one’s own choice. Because Chinese law provides that trials should be open unless they involve state secrets, Human Rights Watch called on diplomats and journalists to ask to attend Dhondup Wangchen’s trial.